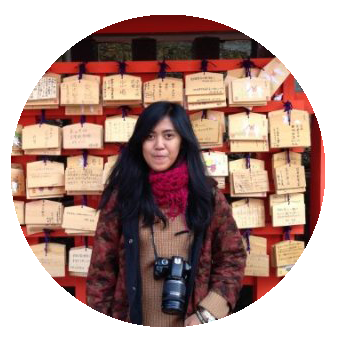 I’ve been dreaming to visit Maldives since a long time, ok you got my point, I am a girl with so many dreams haha. But really, visiting Maldives is one of my bucket list. Not to mention that we have been overdosed by hundred of Maldives pictures advertised everywhere that show the awesomeness of this country. 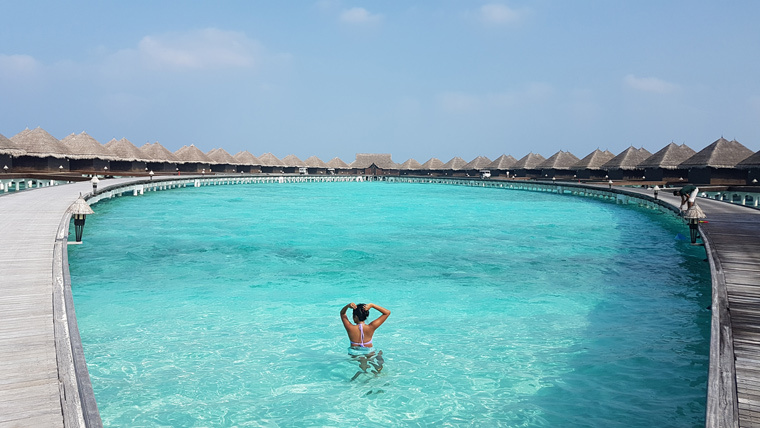 A tosca blue color water, a 5 stars fancy resorts constructed with overwater concept, beautiful sandy beach and crystal clear water that looks like a natural private swimming pool. Okay, now tell me how come people not dreaming about this place ? I always remind myself to never set any expectation to places I would like to go, and that’s what I did before I arrive in Maldives. Keep my expectation as lowest as I can and let the fact surprise me later. I have heard that Maldives is a part of Srilanka country, but no it’s not. Maldives is an independent country located in indian ocean (geographically below srilanka) consisted by 1200 islands. I was so surprised knowing the fact that every island in Maldives is owned by one resort. So basically, there is only a few islands where the local Maldivian still living. My night flight from Singapore to Maldives caused me arrived when the sky was dark already and I couldn’t feel the vibes of Maldives right away landed at the airport. Ibrahim Nasir International Airport was located in one island in Maldives, it was separated with its capital city, Male. 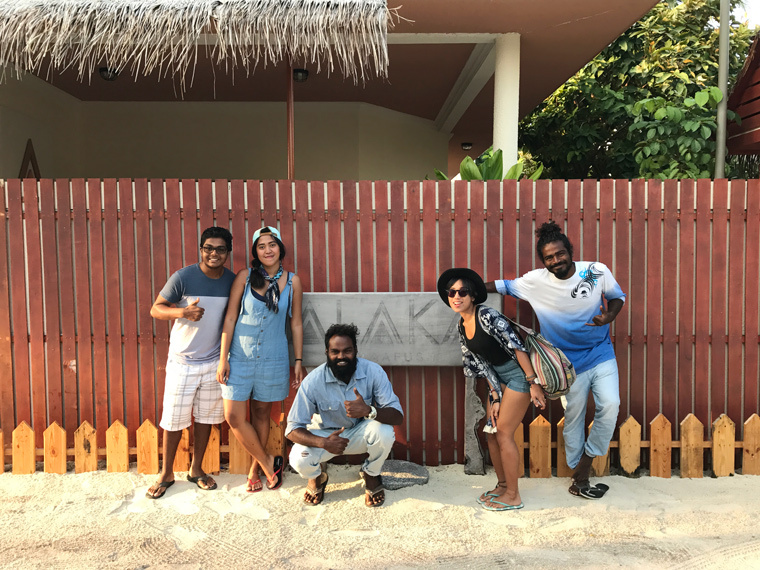 A tall young guy with dark skin and curly long hair hold a sign board of Alaka Maafushi hotel in front of the arrival gate. “Hey welcome to Maldives. Now we are waiting for the speed boat that will bring you to Maafushi” he said. I could see the rumor that says Maldives has a blue tosca colour sea water even though it was dark already from the harbour. The day that I’ve been waiting for so long has finally came !! It was so sunny and bright, we jumped to the speed boat that would bring us wandering around the island of Maldives. I was just happily yelling “OH MY GOD !! look at that tosca blue water ! !” to start the journey. We stopped at turtle point which was our first spot, as excited as before I directly jumped into the sea. Maldives has such a very clear water with great visibility and so many kind of fishes. My first snorkeling experience in Maldives left me such a good impression that caused me can’t wait to the next snorkeling session. Oh I couldn’t describe how happy I was to be back to my favorite playground ! Second stop is sandbank, a sand dune that exist in the middle of the sea. We had a lunch break on the sand dunes with our own private beach view. We were pretty much excited running from here to there, getting dry and getting wet. It even doesn’t need much effort to see thousands of dolphins. They swam around our boat and right under my feet when I was sitting on the boat’s deck. WOW THAT’S STRING RAY JUST PASSED BY ! 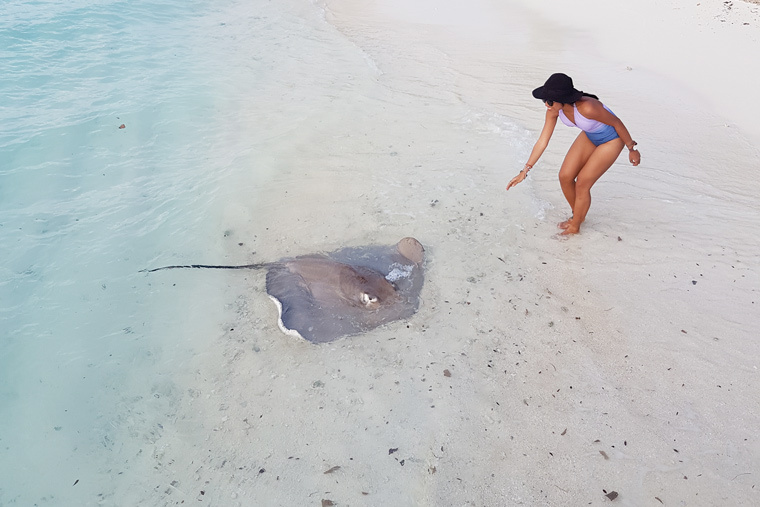 yess we saw some string rays and baby sharks swimming around on the surface. This island became the last spot to end first day in Maldives which is ended up AWESOME ! On the second day we have been asked which resort to choose for a day trip. There are some resorts with different day trip package prices. Usually a 5 stars hotel will charge minimum 100 usd for one day visit including minimum spent for lunch. 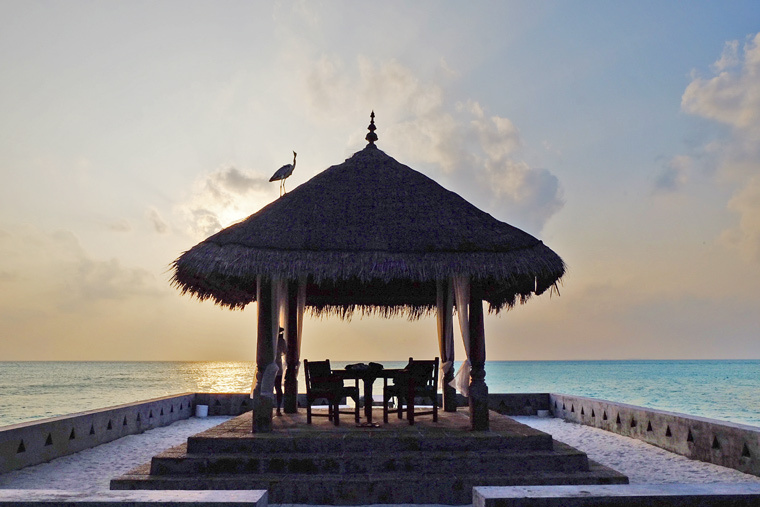 The top 2 resorts are Centaara Resort and Taj Exotica Resort, they are both 5 stars hotel with overwater room concept. 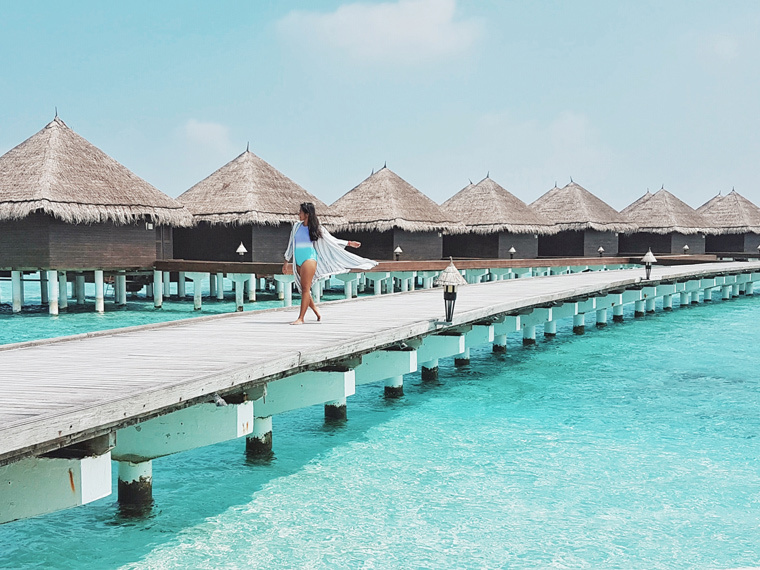 Centaara is the most popular one among travelers as the price is quite reasonable on 143 USD, Taj exotica is more expensive on 173 USD but it has more spots to take photo. The prices are including lunch and a free time exploring the resort but not for entering the room. 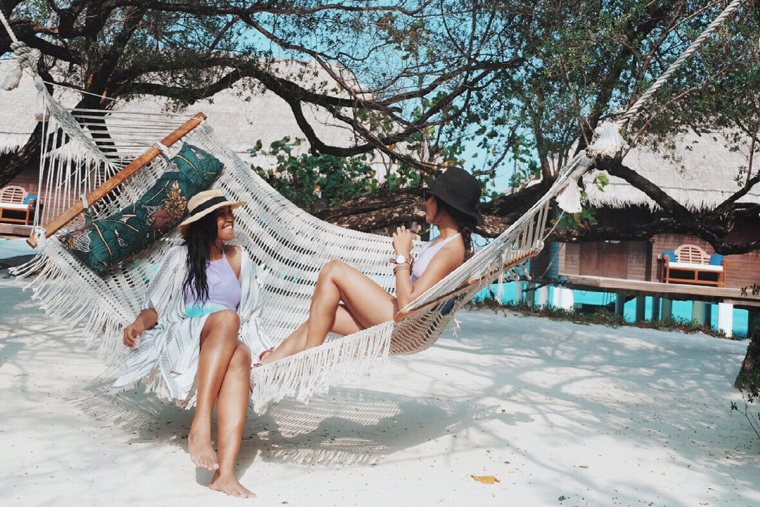 We spent the whole day just hanging around at the resort, chill on the pool and swim on its white sand beach and tosca blue water. On the third day, we left for Thoddoo island and spent 4 days in this tiny interesting island. See how I fall in love with Thoddoo Island on the next post.